Choreographer and dancer Dana Reitz teamed with lighting designer Jennifer Tipton and Michael Singer to investigate the interrelationship of movement and light with set structure and environment. Performers Rob Besserer, Valda Stetterfield and Christine Uchida also contributed not only as dancers, but creative advisers as well. At the heart of Reitz’s investigations are what she terms “performance landscapes” in which all elements of a work are interwoven into a complete visual, musical, kinetic, intellectual and physical whole. Michael Singer’s approach to the work emphasized the dynamic relationships of movement, light, space and meaning. The process of creating “PLACE” occurred over three years of workshop meetings at Michael Singer’s studio, Bennington College’s theater and culminated in a performance at the Dartmouth College Hopkins Center. 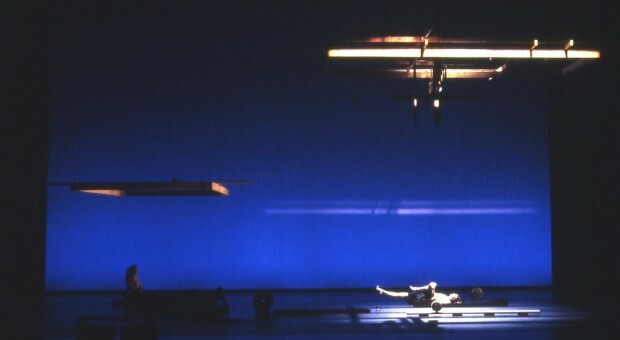 The challenge facing Singer’s set design were to create a sense of boundaries, enclosures, thresholds, and openings without having actual physical built objects positioned onto the performance area stage. To accomplish this Singer constructed two hanging sculptural elements that cast specific shadows onto the performance floor, visible by the audience and transformational depending on the changes of carefully positioned lighting. The objective was to find and magnify the play between interior and exterior places, to create an atmosphere and scale that is both intimate and grand. The project was funded by Bennington College and The New England Foundation For the Arts.